'WOW'... 2000 feet of magnificent open shoreline, spectacular east to west Gulf views of emerald green waters, Sugar White sand beach, dolphins romping in the surf, sea oats, and the most majestic sunsets anywhere, they all are a part of what you can soon call home... The Majestic Sun Beach Resort at Seascape, Destin, Florida. This is Majestic Sun, a luxury condominium resort, overlooking the Gulf of Mexico. Enjoy the many extras of this two bedroom deluxe vacation home, with the comforts and amenities you want and expect. Relax around the 3200 square foot indoor/outdoor heated pool with waterfall accents, tropical landscaping, and whirlpool. Relish the evening walks along the white sand beach, watching the sunset, enjoying the good life. Or, visit the onsite fitness center. Have a quick bite, or a leisurely meal in the onsite restaurant (under development). Life is about choices, and your choices are all but endless at Majestic Sun. The amenities of an 18-hole world-class golf course, eight tennis courts, championship sport fishing, some of the finest choices in casual or gourmet dining, designer outlet and specialty boutique shopping, and you have the total package of location, luxury, and lifestyle. Then, there is always a chance to just lay back and enjoy the day. Keywords: Condominium 'Diamond Model', 2 bedroom, 3rd Floor, Ocean view, Ocean front, Golf course, heated pool, indoor pool, shopping, Silver Sands, Destin Commons. My name is Don Williams and my wifes name is Joy. We love Destin so much that we have moved here now. We love Destin because of the beaches and the clear beautiful water. I love playing golf and Joy loves to go shopping so Destin makes for a great place for both of us. I like Majestic Sun because of how close the condo is to the beach and what wonderful views we have of the beach and gulf. The water is an Emerald green color most of the time and is very clear and beautiful. 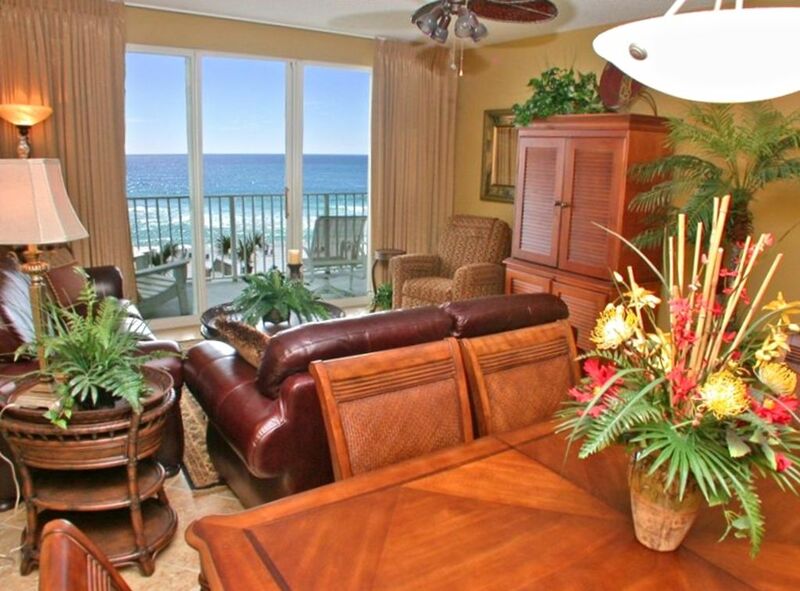 This condo offers some of the best gulf views of any place in Destin. You can see dolphins swimming by early in the mornings. Majestic Sun has a nice outdoor pool and also has an indoor heated pool. Seascape Golf Course is at the rear of the property. Majestic Sun is very convenient to everything. This condo has one of the best views of the beach and ocean anywhere in Destin. The Golf Course is on the North Side of the Building. Check out the virtual tour for the awesome views. You can see the beautiful View on the Virtual Tour. This unit has awesome Gulf views. The condo has a land line in the unit. This Condo has it's own Central Heat and Air units. Living room has leather sofa and love seat and a brand new 50' Samsung flat screen tv 2014. Brand new 2012 stainless steel Kitchen Aide dishwasher. Brand new 2012 side by side stainless steel Kitchen Aide refridgerator. Brand new 2012 stainless steel microwave. The Kitchen has just been completely renovated 2012 with stained cherry wood cabinets with granite counter tops. All brand new stainless steel Kitchen Aide appliances. Living room has brand new 2014 50' Samsung flat screen tv. (3) Living Room has 50' Samsung TV, Master has 32' LCD Flat Screen TV. Guest bedroom has 27' flat screen tv. Balcony is accessable from Living Room and Master Bedroom, Has 4 Chairs and Patio Table with two additional Lounge Chairs. Seascape golf course is located at the rear of property. Condo was clean, cute and well maintained. Miramar Beach was amazing. Great time. Don was wonderful to work with. Unfortunately our trip was cut short due to Hurricane Michael. Don personally called me to make sure we were safe and was more than fair with us due to the mandatory evacuation. We will be back. Beautiful view. Lovely easy access condo! 2nd Time & Better Than Ever! This is our second year in a row renting Don and Joy's beautiful condo. My sister and her husband drive in and pick up my husband and I from the airport-then it's off to our home away from home. The condo has a fully stocked kitchen so we eat in for breakfast and lunch (& a couple of dinners). There's a close Walmart for all the other necessities for the week. Both bedrooms have their own bathroom and big,comfy king sized beds. Enjoying coffee each morning on the balcony looking at the gorgeous emerald water is priceless! A dip in the pool after our beach day was always a nice finish to the day. We love Don and Joy's condo and hope to make this a yearly event! Don & Joy's condo was amazing! Great location and very clean!! Don was great to work with!! We had a great stay in Don & Joy's condo! Their condo was super clean! The beds are super comfy! The location is great, as you don't have to use an elevator because they're right off the parking garage! Don was very accommodating when we thought our plans were possibly going to have to change. It has a great view of the beach & the pool. This was the best condo we've stayed in at Majestic Sun and we will definitely be back! Our family had a great vacation and made lots of memories! I highly recommend renting from Don & Joy and staying in their condo!! You will NOT be disappointed!!! I can't wait till next year! !